But Australians have been terrorised before and told to leave parts of Indonesia to avoid travel there because of planned terrorist attacks, [and false flag operations], on westerners especially when it's politically correct, [a US call to arms], and the Howard government. The Federal Government yesterday issued a warning of a terror threat in two Sulawesi provinces. Red-hot! Any news that hypes up fear in Australia will be reported preceding the election. Govt: "We continue to receive reports that further attacks are being planned against a variety of targets, including embassies, international schools, international hotels, churches, shopping centres, transport hubs or identifiably western interests,' the advice said. "We advise Australians to avoid all travel to the areas around and between the cities of Saroako in South Sulawesi province and Salonsa in Central Sulawesi provinces until further notice. Australians in these areas are advised to depart." THE DAILY TELEGRAPH: "Muslim gunmen believed to be from Indonesian terror group Jemaah Islamiyah, [? scapegoats for the Coalition of the Killing's resource war's in the Middle East, allegedly], killed 11 Christians in Central Sulawesi province in October to mark the anniversary of the Bali bombings." GKCNN: "Believed to be from a terror group Jemaah Islamiyah but if they believed that, then they could also hold the belief that they were a group of Martians if it suited them. Perhaps they should hold back on what they believe until they know the truth? Or would that not be so sensationally adept for Howard's media empire?" DAILY TELEGRAPH: "On the anniversary of the Bali bombings?" GKCNN: Like! Face to face with the Bali Bombers! Nines Sunday program? Viewers we're told by Sunday's Sarah Ferguson, who alleged she had taken a hidden camera into the prison to interview the Bali Bombers. I wonder if that's the law in Indonesia? Did she have permission for the camera? Would she take the risk? I don't think so! SUNDAY: Face to face with the Bali bombers! "The head of intelligence for the Australian Federal Police says you can't defeat terrorism if you don't understand the mindset of the terrorists. SUNDAY: Sunday this week, [allegedly], goes inside the minds of the Bali bombers, [not the Bali Bombers provocotures, the CIA? ], to understand their beliefs, their motivation and to discover whether they will strike again. SUNDAY: According to one of the most recent al-Qaeda, [US demon], statements, Australians are at the top of their hit list in Indonesia. [Because this is a USA call to arms on Iraq.] And the man who Indonesian police say is the leader of Jemaah Islamiyah, Abu Bakar Bashir, says that Muslims are training for jihad, holy war, because they are being oppressed by America." GKCNN: "You can't defeat terrorism, suits Howard fine! So you need superman to deal with them. All them terrorists? But the mindset of the terrorists is the mindset of the politician. Abu Bakar Bashir is a preacher and a teacher nothing more and nothing less, so why do they lie? What is it about having this demon image taking the blame away from the perpetrators of crimes committed in the Bali Bombing? Show us the evidence and name names of the alleged perpetrators? On the first effort: with the bombing America wants to prove that terror really exists in Indonesia. On the second: America wants to build an opinion that the terrorists who launch terror in Indonesia are Moslems. Meaning there are in some Islamic boarding schools (unclear). And then, terror in Makassar was linked to the Committee to Uphold Islamic Sharia (KPSI, ed). So that America wants to build opinion that all terrors took place in Indonesia were carried out by Moslems and in the end America wants to build opinion that terrorists are the Moslems, therefore fighting terrorism means fighting the Moslems. SUNDAY: "The mastermind of the Bali bombing, Mukhlas, [allegedly], told Sunday's Sarah Ferguson, "If John Howard appears before me, I'll butcher him." He explained why they chose terrorism. "America and Australia and the rest only understand the language of force, the language of bombs!" And the so-called smiling assassin, Amrozi, [allegedly], told Sunday: "We chose Bali because there were lots of whities there. That's all!" GKCNN: (This is a story all Australians should see?) "Should see for whom? 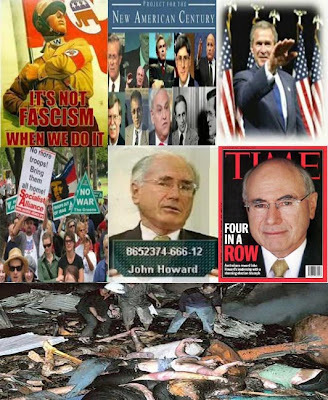 John Howard and his Media Empire, right wing corporate media with an interest in the same. We don't think so, unless you like being lied to. THE DAILY TELEGRAPH: The US also upgraded its travel warning for Indonesia claiming the situation in Iraq had heightened the threat against American citizens in Indonesia.The warning came as Amrozi, one of the, [CIA provoked], ringleaders of the Bali bombing, said some of his accomplices who were still at large could carry out another attack. "Yes, it's likely if they're still alive," he told Channel 9's Sunday program. Jemaah Islamiyah has, [allegedly], been linked to two terrorist bombings in Indonesia that killed 214 people. THE DOG: RUFFER AND ROUGHER! THE DAILY TELEGRAPH HAS BEEN LINKED TO CH/9'S SUNDAY. TELEVISION JOURNALIST JANA WENDT APPEARS COMMITTED TO THE TERROR REGARDLESS OF THE LAWS ALLEGEDLY BEING BROKEN TO GET THE STORY OFF INDONESIAN AUTHORITES. SO HOW CAN YOU BELIEVE THESE CRIMINALS? THESE TWO PROPAGANDA MONSTERS ARE LINKED (SOURCES SAY) OR AT LEAST IT IS (BELIEVED) THAT, THESE TERRORIST CELLS ARE ALSO LINKED TO JOHN HOWARD'S ELECTION AND U.S. FOREIGN POLICY. (SOURCES ALSO SAY) (THE US IS BELIEVED TO HAVE CONSPIRED TO BLOW BALI TO BITS TO ENCOURAGE AUSTRALIANS TO TAKE UP ARMS IN IRAQ WITH THEM. WHY? BECAUSE THE TIMING WAS IMPECCABLE (IRAQ WAR) AND THE CRIMINALS PEASANTS FOUND GUILTY OF THE BALI BOMBINGS WERE DESPERATE TO IMPROVE THEIR LIVES..
Cleric blames CIA for Bali bombing An Indonesian Islamic cleric said the 2002 attack which killed more than 200 people, including 88 Australians, was the work of the CIA. Abu Bakar Bashir says the US intelligence agency had fired a nuclear missile at the Bali tourist strip. Protest Bali bombers' executions - priest The attack was a conspiracy between "America, Australia and the Jews" and the three convicted bombers - Amrozi, Imam Samudra and Ali Ghufron - had been framed: Abu Bakar Bashir. The design and construction of nuclear munitions does not qualify as 'science' or 'technology'. It is insanity. Daniel Quinn has shown that the absolute need to conquer and exterminate all possible rivals, the need to 'conquer' the land, and to bend nature to the rule of man, all derive from core taker thinking. Takers always fear attack because their own philosophy is one of growing rich and powerful through attacks, whether military or economic. Cate Molloy says she holds sitting Liberal MPs accountable for the Bali bombings. Federal Labor Party candidate Ivan Molloy says he supports the sentiments of his wife, a Queensland state politician, who blames the Liberal Party for the 2002 Bali bombings.